WASHER DOES NOT DRAIN OR SPIN. IS THERE A FILTER TO CLEAN? I CHECK THE HOSE FROM THE WALL TO THE WASHER…CLEAR… ANY OTHER HOSES TO CHECK? OTHERWISE, COULD IT BE THE DRAIN PUMP? You didn’t mention anything about it but I’m assuming the washer agitates okay. Assuming that’s the case then, we can see in the wiring diagram that the lid switch must be okay. Because if it were not, the washer would neither agitate nor spin/drain. So, with the lid switch ruled out, that really only leaves you with a bad drain pump or a blockage in one of the hoses to or from the pump. You mentioned that you checked the hose from the wall to the washer. Did you check this hose all the way up to the pump? The way I do it is to remove the drain hose from the drain pump and then blow through the drain hose. You should clear an initial slug of water and then the hose should blow freely. This proves that the drain hose is clear. If the drain hose is clear, then the problem lies elsewhere; either the drain pump itself or the suction hose going from the tub to the drain pump. By the way, the suction hose is simply the other hose attached to the drain pump. If you follow the drain hose from the wall all the way back to the pump, you have located the drain hose. The other hose attached to the drain pump is the suction hose. You can check the drain pump suction hose by disconnecting the suction hose from the drain pump and pouring a little bit of water into the tub and then seeing if it comes out of the suction hose where it attaches to drain pump. You can find whatever appliance part you need through the parts search box here at Fixitnow.com. No harm in buying and trying with our 365-day, no-hassle return policy, even on electrical parts that were installed! 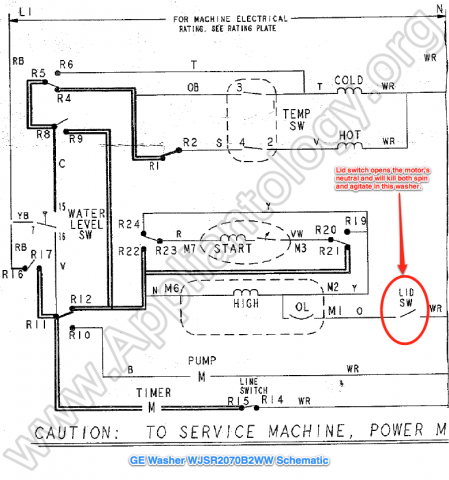 This entry was posted in Washer Repair on April 12, 2012 by Samurai Appliance Repair Man.